Industry Insight: Can TEFCA Ensure Interoperability on a National Scale? 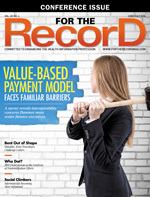 As the health care industry continues its comprehensive shift toward value-based care, care providers and their partners have rallied behind interoperability as a cornerstone of this new model. Although the road to true, nationwide interoperability has not been smooth, we're seeing great strides with new legislation. In late 2017, the Office of the National Coordinator for Health Information Technology (ONC) rolled out the Trusted Exchange Framework and Common Agreement (TEFCA), a provision under the 21st Century Cures Act. In the TEFCA proposal, ONC outlines a clear goal to build and maintain trust by establishing a framework that will make secure data exchange between disparate EHRs as easy as pushing a button. The TEFCA proposal also notes that the development of a national health information exchange (HIE) will empower partners and patients through better care coordination and improved workflow. But while TEFCA should play a valuable role in fostering a more interoperable environment for the health care industry, it may end up creating more problems than it solves. As we noted in InSync Healthcare's comments submitted to ONC on February 20, TEFCA is a step in the right direction, underscoring the importance of interoperability. Easing the flow of information between all care stakeholders, including patients, will undoubtedly drive better outcomes while improving efficiencies—the two tenets of value-based care. The ONC draft outlines a utopic vision for "a system where individuals are at the center of their care and where providers have the ability to securely access and use health information from different sources" not limited to EHRs. It is encouraging that the benefits of interoperability—better care coordination, more efficient work flows, and cost savings—are so well understood. However, achieving true interoperability with no downsides or limitations is tricky. Even ONC admits that current interoperability efforts have fallen short of the ambitious "meaningful use" parameters established with the 2009 EHR Incentive Program. The TEFCA draft notes, "There are more than 100 regional [HIEs] and multiple national-level organizations that support exchange use cases. … While these organizations have expanded interoperability within their particular spheres, the connectivity across all or even most of them has not been achieved." However, existing interoperability failures are not necessarily the fault of health care providers. As one researcher notes in the New England Journal of Medicine's Catalyst, despite a substantial increase in EHR adoption, a subsequent ease in health data following patients across care settings has not transpired. The researcher also notes that if interoperability were easy, there wouldn't be this great of a struggle to achieve it throughout the industry. • Minimum data set. According to the TEFCA draft, the policy is split into two important areas: Part A — Principles for the Trusted Exchange and Part B — Minimum Required Terms and Conditions. According to ONC's blog, Part B identifies a set of minimum terms and conditions to help ensure common practices are in place and required of all participants. While it is important to define the minimum data set (MDS) so existing HIEs can adopt its standards, establishing a national version could potentially limit the sharing of important patient information that exceeds the set minimum. For example, what if the MDS is 1,000 data fields but a practice uses an EHR with 1,001 fields? Also, sometimes the most valuable information is found not in structured data, but rather within the unstructured narrative of EHR practice notes. • Security. In theory, condensing everything into a national HIE would ease the flow of information for patients across care settings. However, all this free-flowing patient information would also require protection by the most robust security solution possible. But what if that weren't enough? With security at the forefront of health care technology, there are legitimate concerns regarding the industry's ability to protect a national HIE. Consider the fallout of the recent Equifax security breach. By funneling protected health information into a single pipeline, a hacker could gain access to hundreds of thousands of patient records in one single breach. The impact would be far more profound than a breach impacting records contained within a health system. While extraordinary measures would be made to protect a national HIE, there's no way to guarantee such measures would suffice. • Cost. In the EHR market, any organization, big or small, can participate as long as they follow the minimum regulatory and security requirements. However, the ability of companies to absorb extra costs is far from equal across the board. The process of "on ramping" EHRs into a national HIE adds significant cost and complexity that is manageable largely only for major health care technology players such as Allscripts and Cerner. On the other hand, smaller EHR and health care technology solution companies would be weighed down heavily by these additional costs. If a national HIE was to be created, larger EHRs would have an unfair advantage moving forward in the bidding to control its standards, resulting in those companies setting guidelines that would make it more difficult for smaller EHR vendors to participate. • Innovation. When small EHR vendors have to shoulder the costs of participating in a national registry, it only increases their likelihood of folding under pressure. As more financial resources are allocated toward participating in a national HIE, less money is devoted to toward innovation. In this environment, new, innovative market entrants may feel reticent to open their doors. While arriving at consensus is challenging, tackling the interoperability issue is better addressed on a smaller scale—even if aligning vendors, providers, patients, and other stakeholders takes more time than creating a nationwide HIE. Several years ago, as part of another organization, current members of InSync Healthcare's executive leadership team developed and deployed a platform that enabled patients and providers to connect to HIEs for the purpose of aggregating and concatenating a patient's longitudinal medical record. By aligning this EHR technology with that of others, it was possible to achieve interoperability on a small scale. In doing so, patients and providers were empowered and all caregivers gained access to individual medical records regardless of the originating technology that captured clinical information at the point of care. That's just one example of how vendor collaboration can effectively promote interoperability; there are others throughout the country—and we're only in the beginning stages of value-based care. In an ideal world, the industry would develop a tool that's more akin to a national registry than a national HIE, whereupon patient IDs could be used to unearth all sources of health data. Patients could either access these data points or grant access to providers. Patients would be the aggregation point, thereby controlling access (except in certain emergencies), and technologies such as blockchain could be incorporated to secure the data. Those preferring not to participate would be able to "opt out" and have their records removed from the registry. While the idea of a patient registry hasn't yet caught on, health care providers still have options as they navigate an uncertain future. Moving forward, sharing patient data securely and effectively will become more essential in order to generate optimal patient outcomes while simultaneously maximizing efficiency in a value-based care environment. For now, it's recommended that providers stay vigilant as regulatory changes produce a massive impact on every aspect of care. To handle any potential changes and best position themselves to align with TEFCA recommendations, physician practices should speak with their EHR vendors about how they plan to ensure providers are compliant with the regulations. However, practices shouldn't stop there. It's also imperative to forge a dialogue with provider partners about what steps they are taking to improve care coordination as interoperability transitions from a buzzword to a way of practicing medicine. — Charlie Hutchinson is the CFO of InSync Healthcare, a provider of solutions for behavioral health and primary care practices that want to focus on patients, not technology.